Bad acting, bad directing, bad dialogue and a bad story. 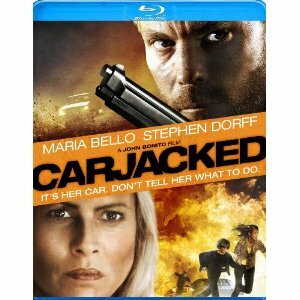 I truly wish I could stop this review with that, putting as little effort into reviewing Carjacked as was apparently spent creating it. Perhaps I am being too harsh, but the longer I watched this film the more I felt I was wasting my time. It begins with a contrived establishing sequence and punishes the audience every moment after. And this is one of those films which are not helped by Blu-ray; instead, it shows even more detail in the glaring flaws. Maria Bello stars as Lorraine, a single mother with an unreasonable ex-husband and serious money issues. Her 8-year-old son is all that she has, but Lorraine is stressed out and unable to stand up for herself much less her son. After going to a group counseling meeting, Lorraine realizes that she needs to be better at standing up for herself. The perfect opportunity arises when Lorraine and her son are carjacked on the way home by a fugitive bank robber (Stephen Dorff). The problem is that Lorraine doesn’t actually stand up for herself until the very end of the film, and it is a long dull road getting there. Although the worst acting in this film is done by the child actor, it is Maria Bello whose performance is most disappointing. Dorff has long since been relevant, despite his minor role in the special effects driven blockbuster, Immortals. The actor this film is most disappointing for is Bello, who is a two-time Golden Globe nominee but still manages to come off as an amateur actor. Nobody comes out unscathed, and although some of the blame can be placed on the script, the direction must have been awful for every line to seem so unconvincing. There is no reason to watch this film in high definition, despite one or two action sequences amidst far too many scenes of badly written dialogue. The special features on the Blu-ray disc include only a behind-the-scenes featurette.